He has come close in the past but today Freddy Sudhoff delivered on years of promise to finally take his first ETS win and add his name to the championship’s exclusive Winner’s Role of Honour. 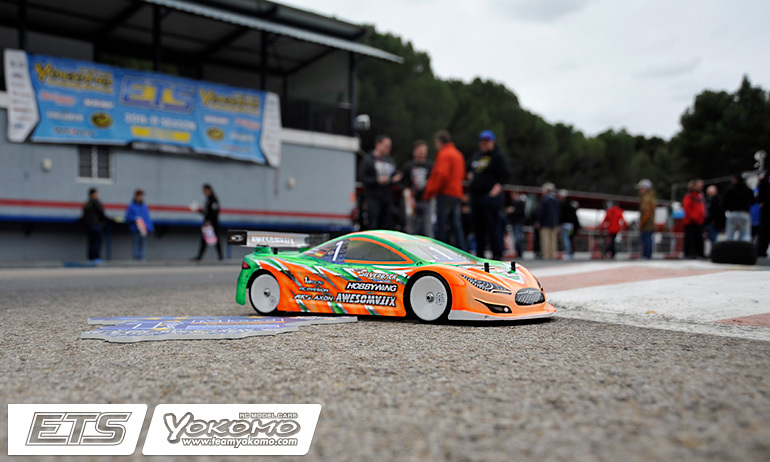 Having secured his first ever TQ yesterday in Spain, the Awesomatix driver converted that into his first win with a repeat dominant performance in A2, again ahead of Ronald Volker. A hugely popular win for ‘Fabulous Freddy’, the Round 3 win also marks the first for Awesomatix in touring car’s premiere category and puts their long time lead driver now firmly in title contention. 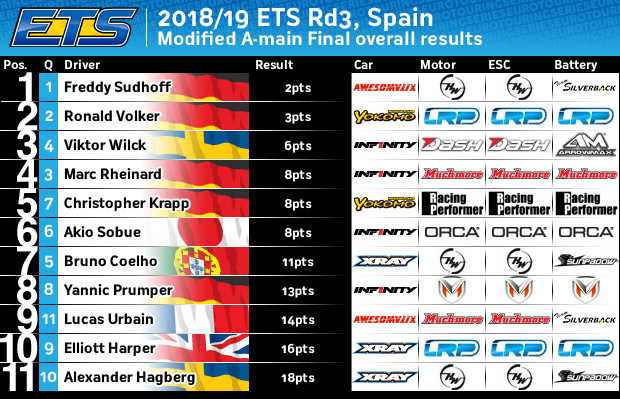 The first outdoor races of the ETS season, Sudhoff’s success is also a significant boost for the Russian brand who previously struggled against their rivals on asphalt. Finishing runner-up at the Asoger RC track today, Volker retains his championship lead but it is down to a single point with Sudhoff’s maximum points haul moving him up to second spot. 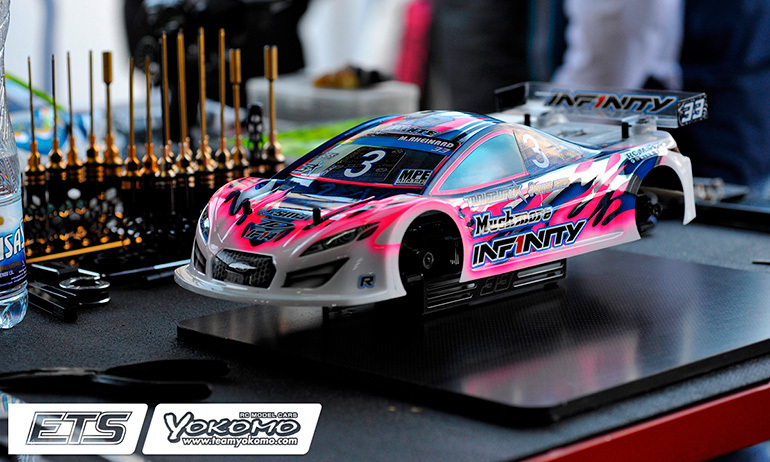 With reigning champion Bruno Coelho having a tough weekend following his win at the previous round, ending up 7th, the podium was completed by Viktor Wilck ahead of Infinity team-mate Marc Rheinard. ‘Again amazing. The car was better than the first race. I felt super confident and just completely focused on driving’, was Sudhoff’s reaction on winning A2. He continued, ‘After one and a half minutes I had made a gap and was just trying to stay in my rhythm and not think what the outcome would bring. Four years ago I was close (to the overall win) in Hrotovice but to get the first win on asphalt is better because in the past we had issues on this surface. 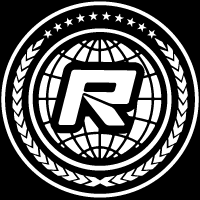 Finally now we can deliver on carpet and asphalt’. With team-manager Max Machler describing his driver’s win as the culmination of ‘7-years of hard work’, Sudhoff acknowledged Machler’s input. He said, ‘I have to thank Max for his work on my car. At this level of competition you can not win on your own, you win as a team’. Seeing off the challenge of Marc Rheinard to win A3, Volker summed up the race weekend by saying, ‘First of all congrats to Freddy. It was a well deserved win. I couldn’t challenge him today’. 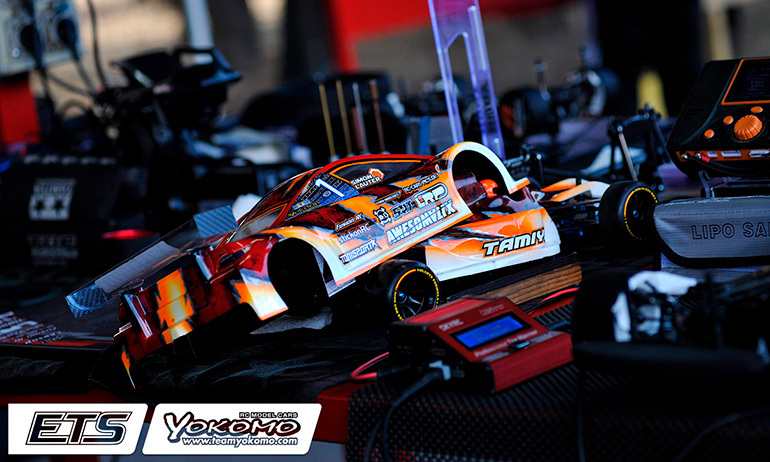 The only driver to podium at all three races to date, the Yokomo driver said, ‘I have to be happy with finishing P2 and to still be leading the championship. On Thursday our performance on asphalt was very promising and the car felt awesome. I have to thank Hayato Matsuzaki for his help. We just need to work on set-up to make it better for changing conditions but I’m very positive for the rest of the season on asphalt’. ‘It been a long time since I made an ETS podium so I am happy for that’, was Wilck’s reaction to his first podium since joining Infinity’. The Swede continued, ‘since practice we improve the car little by little and it seems to work good in lower grip’. Asked about his incident with Rheinard in A2 he said, ‘be braked for Ronald but I didn’t brake in time. It was an accident not intentional’. 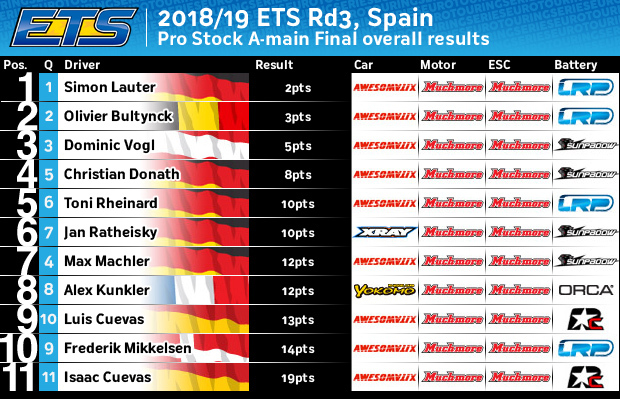 Ending up with a P3 which he backed up with another P3 in A3, he concluded by saying, ‘the Awesomatix was a little too fast here but for sure I am positive for the rest of the ETS season’. ‘Not my day’ was how Rheinard summed up the finals. He continued, ‘Qualifying was good and the first A-Main started good until I had a problem with the tyres. In the 2nd one I got taken out which meant the last one didn’t really matter. A weekend to forget but one positive is that the pace was there’. Spain was to prove a happy hunting ground for longtime ETS racers with Jitse Miedema making ‘a dream come true’ when he took both his and Infinity’s first ever Formula win. Qualifying second, the Dutch driver secured his first overall win in the best way possible when he took the A2 victory ahead of class master Jan Ratheisky. The multiple champion and race Top Qualifier came back hard at Miedema putting him under intense pressure until he attempted a pass and got too close to the boards and got stuck in the turn. Winning A3, Ratheisky would finish 2nd with last year’s winner Olivier Bultynck completing the podium. In Pro Stock, Simon Lauter moved clear at the top of the points table as he wrapped up maximum championship points early with another win from the TQ spot in A2. 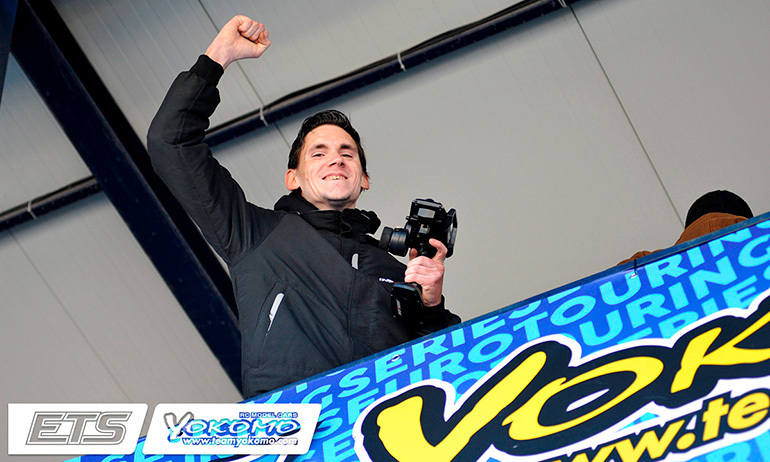 His second win of the season, the Awesomatix driver was joined by team-mates Bultynck and Dominic Vogl on the podium. Winner in Daun and coming into the weekend as joint championship leader, last year’s race winner Machler could only manage 7th, a result the German will be hoping is one of his dropped rounds come the end of the season. 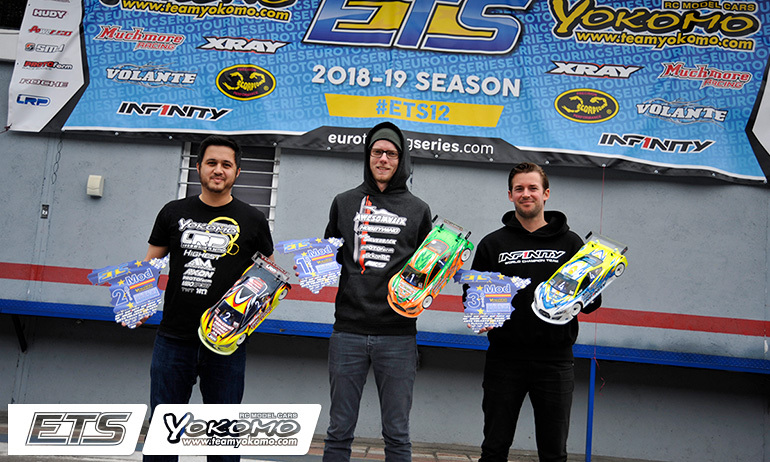 In the 17.5 Stock class, Tobias Baumbach made use of his TQ to win A1 & 2 to take the win while victory in A3 for Luis Moreno gave him the runner-up spot with championship leader Daniel Pöhlmann completing the Top 3. The only class to go to A3 to decide the winner, 40+ Masters came to a battle between Top Qualifier Toni Mateo, winner of A1, and Alexander Stocker, winner of A2. Under pressure from Stocker, Mateo would roll on the curbing and with his car sitting on its roof the entire field went passed. Stocker won the race ahead of Beni Stutz for his third win of the season while Stutz completed the podium behind Mateo.